The clock marking the time I've been unemployed is about to hit two weeks. Interestingly enough, the two-week point falls on the same day as the one-year anniversary of Taste As You Go. Before I was laid off, I had wanted to spend time planning a series of posts celebrating how much I've learned through writing this blog over the past year but I was forced to put all of that aside in order to take care of Real Life Stuff. In an attempt to highlight the recipes I've created over the past year, I'm going to use some of them to illustrate that cooking doesn't have to be a scary endeavor, that it can actually serve as a means of alleviateing stress or anxiety, two things I'm feeling a lot of these days. I can understand why people are scared to cook, especially if they haven't spent much time doing anything in the kitchen other than eating or cleaning up after a meal. Thinking back, I can remember the questions that would run through my head as I was learning how to read and break down recipes - How much is a pinch? How do you know when to turn something over? How do organize yourself so all of the food finishes cooking at the same time? Over time, I became more comfortable in the kitchen, and now, I use cooking as a way to relax and unwind. Cook something that reminds you of family or loved ones. I created this dish, Pan-Fried Chorizo with Caramelized Onions over Mashed Pototoes, because the individual ingredients reminded me of home and of my parents. Chorizo is something I grew up eating, thanks to my father's Portuguese background, while the caramelized onions were something my mother would make just to snack on. Pairing the two over mashed potatoes, one of my absolute favorite comfort foods, seemed natural to me. And who's going to turn down a big helping of comfort food after they've had a long or stressful day? Look around for inspiration in your everyday life... you never know what kind of delicious meals will result! Blend something to your heart's content. It's not surprising that blending something can be satisfying, especially when you do so on high speed. You can use the blender to create something sweet, like my Simple Mixed Berry Smoothie. And, you can maximize the therapeutic power of blending food by making the smoothie as a reward after a long run or a hard workout at the gym. If you're looking for something more savory, you can use the blender to make fresh Spinach Pecan Pesto Sauce to toss over hot pasta or to chill and use in cold pesto pasta salad. The sauce you make at home will taste infinitely better than any jarred sauce you can buy in the store, so you can take pleasure in knowing that you made it yourself. Pound your frustrations out on a piece of meat. Sometimes you have those days where you feel that hitting something might help you feel better. Sally Field's character in the movie Steel Magnolias said it best, and the most dramatically: "I-I don't think I can take this! I-I just wanna *hit* somebody 'til they feel as bad as I do! I just wanna hit something! I wanna hit it hard!" Rather than risk damaging your property or, worse, hurting someone, take your frustrations out on a chicken breast and make my Baked Stuffed Caprese Chicken with Balsamic Reduction. The recipe calls for flattening the chicken between two pieces of plastic wrap with a mallet. You'll make a heck of a racket doing so, but I guarantee you'll feel better afterward. When a problem comes along, you must whip it! Learn a lesson from Devo (did I just write that?). Dig out your hand-mixer and use it to whip up butter and sugar until light and fluffy as you prepare the batter for my Strawberry Almond Muffins. Heck, play "Whip It" on repeat while you're cooking if it helps! The smell of these muffins baking will fill your kitchen with the most tantalizing aroma and your stress will just melt away. Serve the muffins warm alongside a hot cup of coffee and you'll forget the reason why you were upset in the first place. Triumph over a recipe that previously bested you. We've all been there. We get excited about a recipe that sounds delicious on paper (or on the screen), but after attempting to make it in our own kitchens, the dish falls flat and we're left with something that disappointingly did not meet our expectations. However, just because a recipe doesn't work out the first time doesn't mean it's a lost cause. 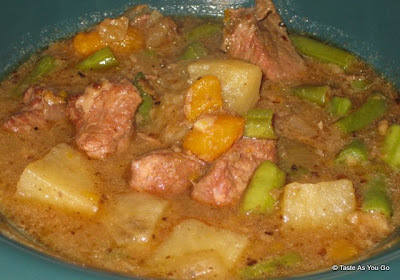 The first time I attempted to make Beef Stew with Sweet Potatoes, the wrong ingredients showed up with my Fresh Direct order. Sure, the stew tasted okay, but it didn't turn out the way I wanted. So, I tried it again, tweaking the ingredients a bit here and a bit there and wound up with a dish that I loved. In fact, I loved it so much that I recommended it to friends and they enjoyed it, as well. Not every dish is going to be a winner the first time out of the gate, but if you persevere and try again after taking some time to think about how you can change the recipe to make it better, you might surprise yourself. So, the next time you're feeling overwhelmed or stressed out, get in the kitchen and cook something! Better yet, get in the kitchen with family or friends and share the experience with them. Turn the preparation of the meal into a social occasion and enjoy the food together. Good food tastes even better when you share it with good company. How do you unwind in the kitchen?